We started with a plate of paleta iberica - melt in the mouth, sweet, shiny slithers of ham from native black Spanish pigs. If you haven't tried it, and like cured meats, then you must. It's my personal favourite and a real treat. 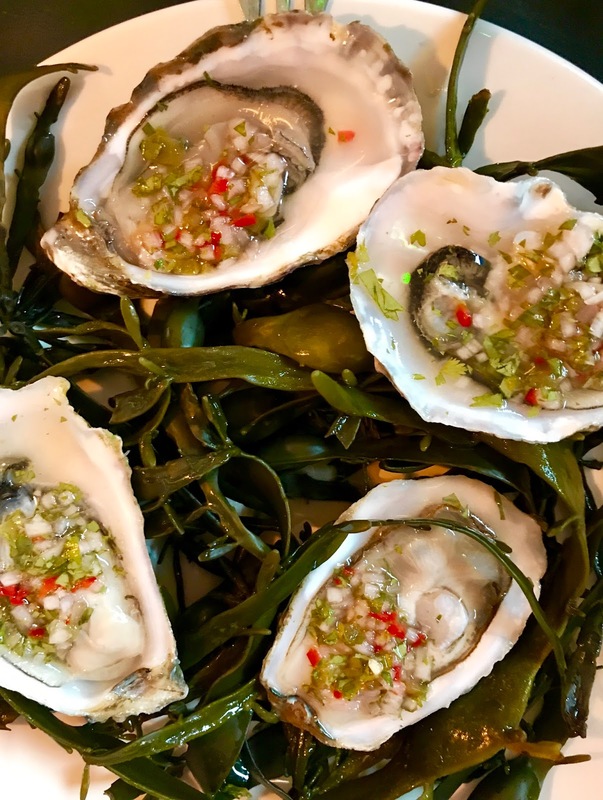 From rich meat to plump Jersey oysters with a chilli vinegar kick. The first time I've tried oysters with this dressing, and it won't be the last. The vinegar cut through the creamy oysters and the chilli rounded off a perfect mouthful. 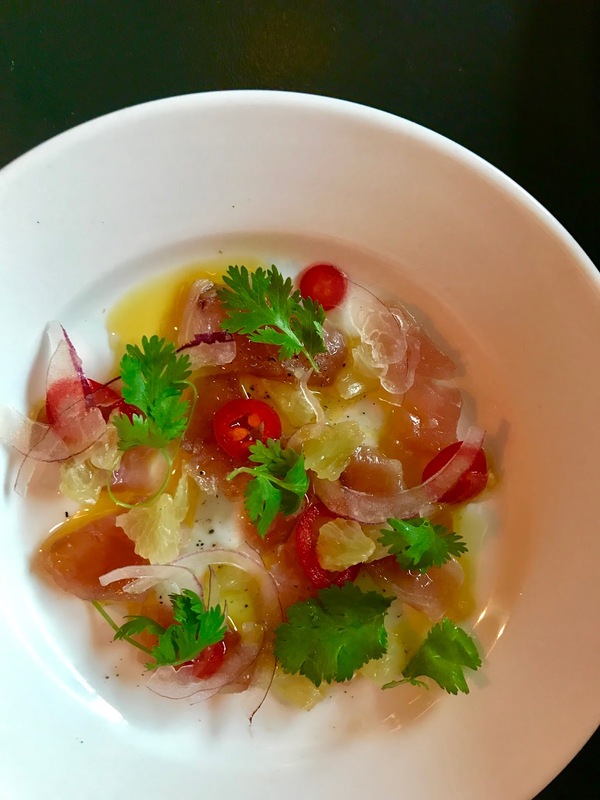 Raw bonito with lime, chilli and very good olive oil was a thing of beauty and more delicious tang. The lightly pickled red onions brought the whole dish together, and we dunked our patiently saved bread in the grassy oil, mopping up all the juices once we'd finished. It's hard to choose a favourite from plate after plate of food heaven, but a surprising front runner was the spelt, peas, broad beans and parmesan. 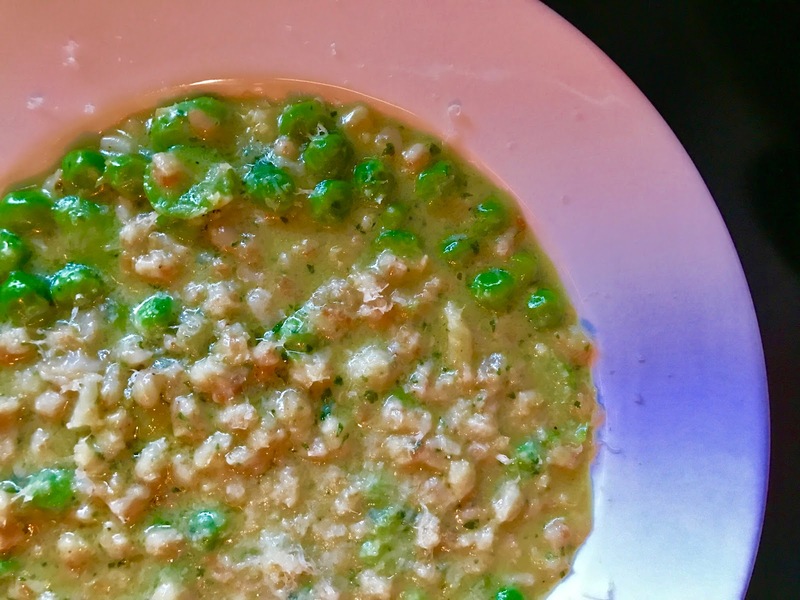 Rich and salty from the melted cheese, the peas and broad beans were just cooked so retained their bite, colour and flavour of summer, while the starchy spelt added a wonderful creaminess to the whole thing. I wrote on Instagram that this was lick-the-plate-clean-good food, and it really was. There was only one dish I wouldn't order again. It wasn't bad, it just wasn't as good as the other plates of heaven we were consuming. The turbot, roast cucumber and dill was the most expensive on the menu at £19, and the least exciting. It just lacked the depth of flavour that all the others had, and was too delicate for me. 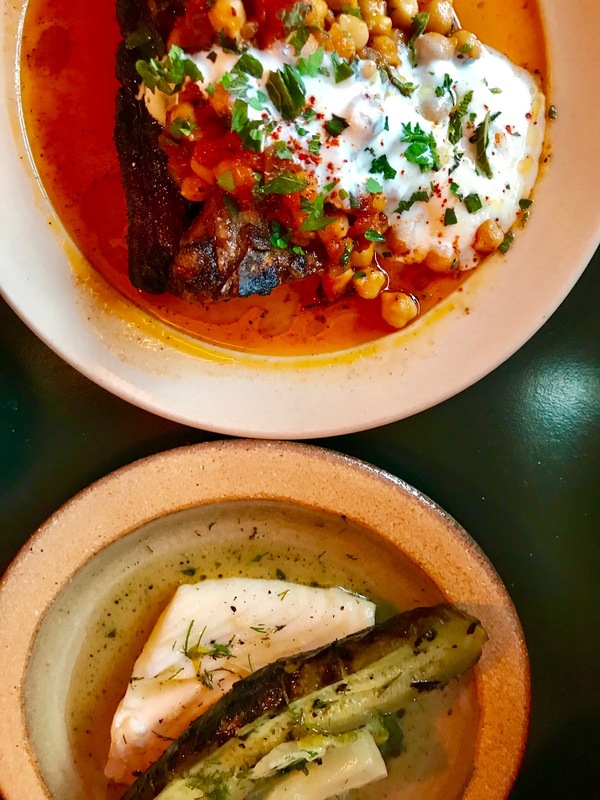 However, it might be because it was brought to the table at the same time as the lamb chops, harissa and chickpeas (which I can't type without remembering the CEO of an Italian company I visited last week describing as chickenpeas at dinner one night!) The lamb chops were probably the best I've ever eaten. Cooked on charcoal, the fat was rendered to within an inch of its life, in a good way, and the meat was pink and juicy and a touch fiery from harissa. A dollop of natural yoghurt mingled with all the oily lamb juices, which we spooned up off the plate long after we'd eaten all the meat and chick(en)peas. 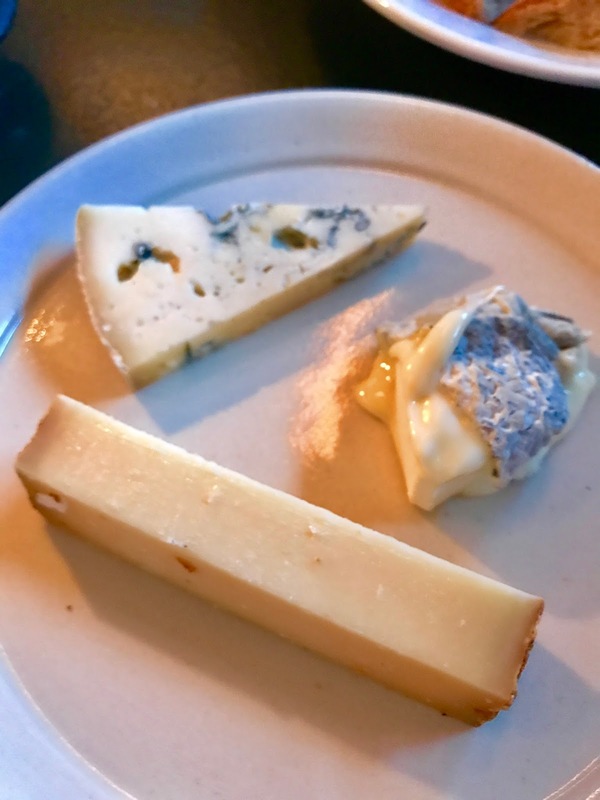 Pudding was in the form of cheese, the names of which have escaped me, but there was a creamy British blue from Devon, a runny, stinky soft French and a salty wicked Comte-esque block of hard cheese. Served with a mountain of bread, it was the perfect end to the perfect meal. See you soon Westerns Laundry, I'm coming back soon, with more hungry stomachs so next time we really can order everything on the menu!